My Cozy Corner: Tablescape # 60 Blue and White and Geese? Welcome to my last Blue and White showcase for January 2013. I've enjoyed showing off my Blue and White this month. I've been in the garden pruning, transplanting and designing the pergola area. If your new to my blog Go Here for the story of My Secret Garden. Now it's Blue and White Time. A photo moment! The orange bow was perfectly in line. I just couldn't help myself. The camera made me do it. This tablescape was a gem to create. I've been collecting this and that for this tablescape just about a year now. Pink tulips are from the local grocery store. What a great resource to have beautiful fresh flowers in the winter months for under $10.00 dollars. The White Geese napkins rings were my inspiration for this tablescape. I couldn't resist buying these white cut work place mats at TM, and using them as napkins. The White Goose I found at the GW. The white flatware was purchased at Walmart for $10.00 dollars. The Blue and White dinner plates were .99 cents each at the GW. If you have ever been to England you will see fields of red poppies growing all over the English countryside. I used another Sango 'ATHENS' 8872 for my chargers. The white plates were my mother's everyday dishes. I love the smaller white cup and saucer. They have no markings and they also came from my mother's home. Truly a beautiful sight. I love tulips especially white ones. This bouquet has a delicate touch of pink. I have so many beautiful things that belonged to my mother. A couple of interesting pieces. A Victorian silver plate sardine fork and a silver plated master butter knife. The tulips have bloomed into a beautiful bouquet. Basking in the sunlight of the dinning room window on a Wintery~January morning. Thanks again for visiting My Cozy Corner. I was looking to see when you started your garden but part of mine will be 5 years old this summer. It takes TIME to develope a garden. I don't think I ever realized that. Your pergola will be perfect for photo shoots and the garden will give you many possibilities for different scenarios. What a pretty setting - you would enjoy that for a special luncheon or spring dinner. I agree that the tulips, at this time of year, are the biggest treat! Your mother's glasses are certainly treasures - I imagine they must be a beautiful weight. A beautiful setting! I love blue and white. I used to have lots of geese in the 1980s...had a kitchen full of them....they flew away over the years...Lovely setting! Thanks for linking to Tuesday Cuppa Tea! That is a gorgeous blue and white tablescape! Wow! I am loving how you matched the blue and white transfer plates with the white embossed ones, the leaves reiterating the pattern so well! I would feel such pleasure and cheer sitting at your beautiful table! Thank you for joining in Tea Cup Tuesday! Hi Betty, Lovely blue and white tablescape. 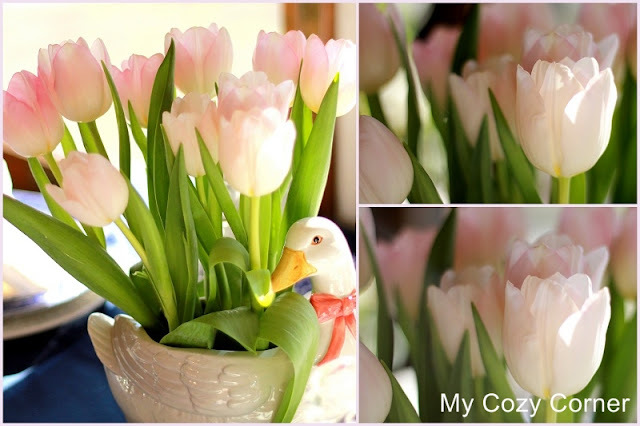 I love the geese -- a pop of whimsy -- and the lovely tulips! Happy Tea Day! Betty, this is truly a stunning tablescape. WOW!!! Your blue and white tablescape is charming and the light pink tulips are such a pretty addition. Your blue and white plates from GW are a wonderful find. I have the exact same butter knife! Gorgeous Tablescape! Everything is just lovely! I just love the silverware. Such unique pieces. Blue and white dishes are my favorite and you do have some very pretty ones. Your table is just gorgeous. I can't believe those are placemats and how wonderful they look as napkins! I am also shocked that you got those plates for 99 cents. My Good Will has no such bargains. Victorian silverplate is exquisite too and I love your mother's glasses. All together it makes such a beautiful table! What a delightfully beautiful table setting! Oh, Betty, I love your pretty table set with blue and white china and those gorgeous tulips! Your mother's little pony glasses are gorgeous too. I like how you have used those lovely lace placemats as napkins. I often do that too. Beautiful silverware also! This really is a charming setting and thank you so much for sharing it with us and joining me for tea. Hi Betty, You got a fabulous deal on the Spode dishes! What a beautiful table! Your table is gorgeous! And what a bargain on those blue Spode plates. Our GW is jacking up the prices on all of their housewares. Makes me very sad. The tulips the silver, everything..just beautiful. Reminds of Springtime to come! A perfectly beautiful tablescape! :) You did GOOD!! Hi, Betty! Nice job!!! The pale pink in the tulips is perfect with the bolder blue & white dishes! I really like the cordials, too. I have some that my Mom gave me about 8 years ago that have a similar pattern but are shorter in stature. They are perfect for an after-dinner sip! It must be really nice to live in Northern California where the weather is still nice enough this time of year for you to get out and work in your garden!!! I think it's about 8 or 9 degrees outside now here in the Kansas City, MO area, with an expected low of around zero tonight. Hmmmmm....I think I need to pack my bags and head west!!! :-) Have a wonderful weekend!!!! Sometimes the simplest thing sparks creativity and helps us build a tablescape with warmth and humor as well as beauty. The geese ceramics set against the classic blue and white is just perfect, and the tenderness of those light pink tulips against the bolder blue is stunning! Beautiful table...you can't miss with blue and white! Great deal on the Spode...one never knows what treasures you will find at thrift stores for pennies on the dollar. This is such a pretty table! it just feels "fresh". And I absolutely love those blue dinner plates! What a great find. And I am drooling over the silver serving pieces! Thank you for sharing your gorgeous table with us at TTF.